Prototypic NMDA receptor agonist which mimics the action of glutamate. Potent excitant. The prototypic NMDA receptor agonist NMDA is effective at a range of concentrations and typically used at 100 μM. 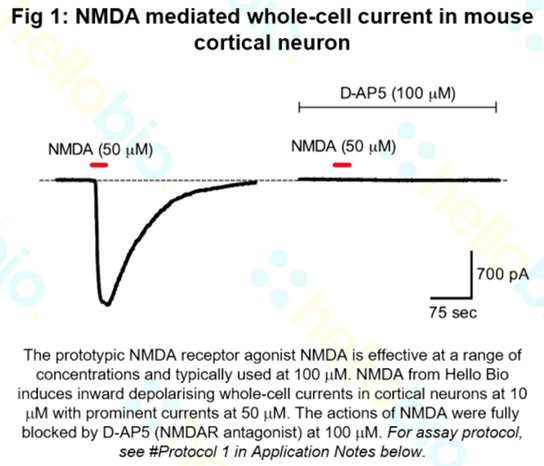 NMDA from Hello Bio induces inward depolarising whole-cell currents in cortical neurons at 10 μM with prominent currents at 50 μM. The actions of NDMA were fully blocked by D-AP5 (NMDAR antagonist) at 100 μM (see Fig 1 above). Neurons were held at -70 mV and continuously perfused with aCSF in the presence of AMPA and GABA receptor antagonists CNQX (10 μM) and Bicuculline (100 μM) respectively and Tetrodotoxin (1 μM) to reduce network activity. NMDA currents were evoked by applying NMDA directly to the recording chamber during continuous perfusion. 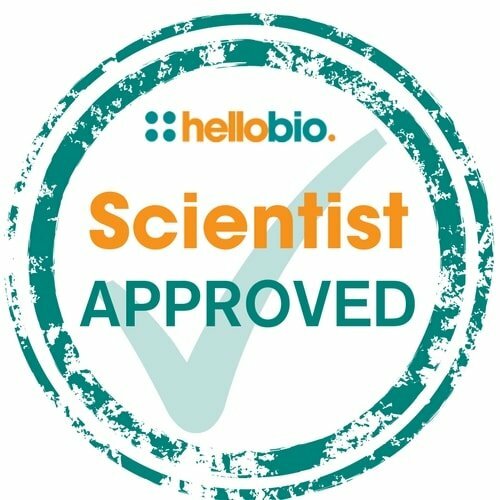 • To test the selectivity of NMDA to NMDA receptors the experiment was repeated within the same neuron in the presence of the NMDA receptor antagonist D-AP5 (100 μM). Under these conditions NMDA failed to induce a depolarising current. N-methyl-D-aspartic acid (NMDA) in the nervous system of the amphioxus Branchiostoma lanceolatum. Regulation of N-methyl-D-aspartic acid (NMDA) receptors by metabotropic glutamate receptor 7. Gu Z et al (2012) J Biol Chem 287(13) : 10265-75. Occurrence of D-aspartic acid and N-methyl-D-aspartic acid in rat neuroendocrine tissues and their role in the modulation of luteinizing hormone and growth hormone release. D'Aniello A et al (2000) FASEB J 14(5) : 699-714.